This charming cabin is in cottage country on the Lower Roaring Rapids section of the Peshtigo River; the same Peshtigo River regionally famous for its rafting and kayaking. 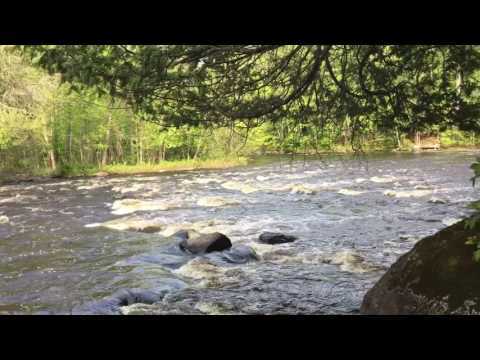 The Roaring Rapids section of the Peshtigo River provides whitewater action on one of the longest continuous stretches of whitewater rapids in the Midwest. Flows ranging from 300 to more than 3,000 cubic feet per second can turn the Class II rapids into Class III-IV waters. If you prefer milder waters, summer and fall are just right for calm rafting, tubing, swimming and fishing. Every memorable “up north” cabin starts with a prime home-site. This cabin is nestled into the woods at the top of a small hill overlooking the river. The cabin is cozy and easy to maintain. In today’s era of giant, overbuilt drywall McMansions, this is the kind of quaint cabin that is getting more difficult to find. Simple up north living at the river is what this cabin is all about. The breezy comfort and beautiful view from the cabin’s screened porch alone make this property worth every penny. Now, add in a fantastic piece of land with 100 feet of waterfrontage and 1.25 acres of wooded privacy. Mixed hardwoods studded with majestic white pines shelter the cabin. The old real estate saying regarding value as being driven by “location, location, location” particularly holds true for this listing. Located northwest of Crivitz, Wisconsin, you'll find yourself in the heart of Marinette County's popular High Falls and Caldron Falls recreational area. Offering fishing, boating and swimming, Caldron Falls Reservoir (1000 acres) and High Falls Reservoir (1500 acres) are the two main draws to the area. For anyone not familiar with these two Peshtigo River reservoirs, these two lakes have mostly undeveloped shore that is protected from development by Wisconsin’s newest state park and state forest. Nearby to the property and on Caldron Falls Flowage, is Governor Thompson State park, a 2800-acre mix of forest, lakes and trails. Surrounding the entire area and on Caldron Falls, High Falls, and the Peshtigo River is the Peshtigo River State Forest. The Peshtigo River State Forest has 25 miles of shorefront covering 3,200 acres of water, with 9,200 acres of forest lands. The location of this cabin property is just north of these recreational waters and lands. Hunting, fishing, swimming, ATVing, snowmobiling, boating, canoeing, kayaking, snowshoeing and hiking are all direct from your land. It's no wonder that the owners are only reluctantly putting this property on the market after fifteen years of happy ownership. The secluded, vintage cabin from the 70's is tight, buttoned up, and well built. Vaulted ceilings and loft open up the interior space and make it light and cheery inside. A shower and changing room, storage closet and galley kitchen complete the interior. Screened windows and doors provide a pleasant cross draft on warm summer days, and a little wood burning stove provides warmth to enjoy the cabin on fall and winter weekends. Clad in cedar, this cabin is easy to maintain, easy to open up at the start of your vacation, and easy to shut down at the end of your vacation. A grandfathered privy, electricity in the cabin, and a water well provide the necessities for enjoying camp. If you want a classic, "up north" Wisconsin cabin -- maybe like the cottage you visited as a kid -- this is it. Click here to open YouTube movie to interior photos of cabin. A detached garage provides storage for the toys you’ll need to maximize your enjoyment of the surrounding great outdoors. If more storage or living space is needed the 1+ acre lot offers the potential to build a newer, bigger garage, or to add on to the living space of the cabin. The land is forested with mixed pines and hardwoods and is not logged over. There’s a good year’s worth of firewood already cut for burning in the wood stove or the fire ring. The topography is level from the quiet little road to the cabin. Contours from the cabin lead down to the Peshtigo River. Views are of islands and rapids in front of the property, and downriver across a deep water pool and sweeping bend. This is an absolutely new listing, and the first time this property has been available in 15 years. Remember to ask about the bridge to the island.